Can I use my analog inputs on the back of the StudioLive Ai loudspeakers that have the Dante option card installed on the Dante network? Yes! When StudioLive AI loudspeakers are in Analog Input mode, their analog inputs are transmitted to the Dante network and can be patched to any other loudspeaker or device on the network. In this way, you can create a Dante networked Front-of-House system with an analog or non-Dante compatible mixer. Can the Dante option for StudioLive Ai speakers or mixers be used in any networked audio situation? Can I turn off the front-panel LED in the grill on the StudioLive Ai loudspeakers? 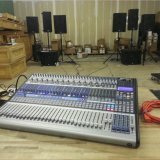 How do I configure a system made up of StudioLive Ai loudspeakers for four-way use? Why don’t the StudioLive Ai loudspeakers seem as loud as my SPL meter says they are?